Currently the notify-osd notifications allot space for the volume control/brightness semi-notifications; this is rather jarring when the volume/brightness isn't being adjusted, unlike in Jaunty where application notifications default to above the volume/brightness. Change in position: The top of any notification bubble should be positioned near the bottom right corner such that if the bubble grows to its maximum height, it is snug at the bottom right corner. Confirmation bubbles should use a slot immediately above that notification bubble slot. Any discussions regarding the position need to be discussed in the ayatana mailing list. It is an open list anyone can join and participate. This is a bug report and kindly do not post comments which do not add any useful information regarding the particular bug. Confirmed on up-to-date karmic. There is a empty space between the window for general notifications and the panel. This space is for the volume or brightness notifications, but if those are not activated, it should not display this empty space. 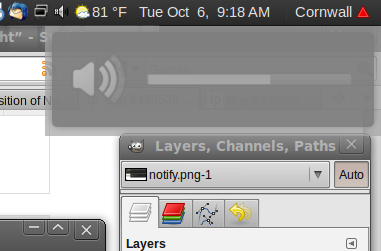 It's a regression, in Jaunty the notification is correctly placed, if there is volume/brightness notification or not. -This is a design decision.Not a papercut. One of the reasons , it was done, was due to complaints of the bubbles blocking the firefox search bar. This way the bubbles that are not triggered by the user dont cover that area. Fair enough, but I think that it looks rather annoying. It looks... wrong. > -This is a design decision.Not a papercut. One of the reasons , it was done, was due to complaints of the bubbles blocking the firefox search bar. This way the bubbles that are not triggered by the user dont cover that area. put your mouse on it and enter text below the notification. So the decision was made to change a system-wide notification system for the sake of not covering up a single area of a single application. But wait, please see my attached screenshot. Oh right, so not only are we tailoring an entire notification system to one application, but also to users who leave their windows maximised at all times. Now every time I get a new notification when typing a paper or writing some code, it shows up pratically in the MIDDLE of the screen. I know you said that it's just *one* reason, but it sure seems like a horrible reason to use as an example. I apologise if this comes off as rude, but I just can't believe that this decision was made. The result looks nothing more than a mistake. I'm sure it can be cooked up so that users who find it a little strange can change it from the slightly-lower position to the place it was in Jaunty? Makes sense in terms of usability, but it's a little dodgy on the design front.. P.S. : The bug I linked above is not a duplicate. It addresses a different problem! You realize that with the notifications coming more down, a more cramped feeling comes up? The notification system loses the beauty of it being an ephemeral, out-of-the-way system. Even if visually the top is now visible at (almost) all times, the area of space that Notify-OSD uses is increased. It's more intrusive, now. Besides, one is more likely to have text in that portion of the screen. Basically, as always with this program, the solution is to allow easy customization! There has been several objections to this change. But IMO , this doesnt seem wrong/ugly/intrusive! They seem to have done it due to concerns raised by other bug reporters in other bugs. - enable the asynchronous bubbles to append without "pushing" the confirmation bubbles down. Would be great to discuss these issues further, so once again I'd encourage everyone to write to the mailing list (Mark may not be subscribed to all bug reports, therefore he may not be aware of some of the conversations). I really dont like the new DAMN empty space. When mouse is hover on the notify, it will be lighter, blur. That is good enough, the space is totally overdo. When we have a empty desktop, no apps started, it shows a big space, then the notify, damn ugly! I know you considered user experience, I just want to say, the jaunty notify is better, really. Yeah... you uncover the FF search bar, but you block other parts, now, too! As far as predictability, they all go exactly where I know them to go. One right after the other. It's not rocket science. If I have an IM bubble, and I adjust my volume, it'd take a very dull person to not figure out that the volume bubble would be next! There's actually a lot to be said for Chauncellor's comment. The original behavior in Jaunty is simple and mindless. Now there's rules of what goes where and why. The original goal of the new notifications, from my understanding, was to be simple and out of the way. Now the more common notifications (at least in my experience) are the ones showing up closer to the center of the screen, intruding more frequently on my work area, and notifications don't pop up linearly and it's not obvious why. The fact that my first reaction was to report this behavior as a bug (and obviously I'm not alone) is proof that this isn't the correct approach. Although it's not a bug, but i think many people dont like the new position! So, please, put it closer to top right. And if there is a tool to change the position, it will be perfect. So, dont put this 'bug' to wishlist! We really dont like the new position, its ugly! Digging a bit more, I saw that this behavior is the slot_allocation policy, set to FIXED for Karmic instead of DYNAMIC for Jaunty. This is not a bad choice but it required that all applications have been fixed and all notifications properly set. And it's not the case. At least for me rhythmbox not behave right and according to many comments of this bug report, it's not the only case. Excellent, at least I have a fallback method. Thank you very much, Julien. Thanks so much Julien! I just applied your patch and it works beautifully. I agree with Nicolas that this should really be some sort of configurable option, whether visible in a GUI somewhere, or definable in gconf. Has anyone commented in the mailing list? I would love to not have to use Julien's excellent fix, and so would everyone else I know that uses Ubuntu. I completely agree! It looks ugly upon startup. Blocking the Firefox search bar, of course, is a much smaller problem than the aesthetics as the bubbles are by nature clickthrough and increasingly transparent as you approach them. Regardless as to whether this is fixed there should be a customization dialogue under Prefs where you can set stuff like this, as well as corners and maybe shape, animation, a whole bunch of stuff. But for the time being change it back! Thank you for nominating this, Mr. Barth. I messaged the mailing list quite some time ago. Has there been any further consideration towards this? Karmic is set to release in less than two weeks! i've read some of your posts but i want to say that perserving a space for the volume really is not a good idea ! For me and my 16:10 laptop screen they are still above the firefox search bar, which is no problem for me as you can simply hover them, but it looks really ugly. If you want to have dedicated positions for the notifications why not change the positions for volume/brightness bar and normal notifications, as the normale ones are far more usual? And why not differenciate notification events with colors or icons? I think that with icons it will be more graphical and with a simple view of the notification you can "know" what is about. they show up underneath each other. appearance-window, so everybody can choose his/her own favorite behavior. > And why not differenciate notification events with colors or icons? > of the notification you can "know" what is about. > notifications default to above the volume/brightness. I personally think that the notifications should be bottom-left, bottom-centre or bottom-right to avoid the problems with covering window buttons/firefox seach bar etc. However, then we are back to the "Notify-osd position should be configurable" debate, which would really solve the problem. "The position is final for 9.10 but can certainly be reconsidered for Lucid. it "out of a corner". matter which way it goes, and am happy to make the call so far (i.e. happy to be the one with the thick skin). I've been waiting for this feature most eagerly! I just don't believe that this can be the default setting. It's so annoying and weird. The notifications just appears on my tabs all the time! I see that they are a lot of people complaining about this implementation, when i can't see crowd complaining about the top right implementation!? So why did the implementation change, and why now it'slike impossible to make it back like it was? They're trying to make a better desktop experience. Even if none of us like what they're doing, they're trying to make it better for us. Some of their reasons were pretty interesting, and I had never heard some of them. Thankfully, we have Julien's fix to hold us through until we get the ability to customize notify-OSD. That's my biggest complaint right now, and this would fix so many complaints with people. We could put asynchronous notifications in the top-right corner if synchronous notifications were centred horizontally (top, middle or bottom). I think the way to solve all this usability brouhaha would be to allow the notification to be dragged around and have it be anywhere the user wants it, and all subsequent notifications will appear in the same place the original one was before it faded out. Just my two-hundredths of a dollar. OK as a workaround I can confirm that manually setting gconf-key "/apps/notify-osd/gravity" to "2" sets it to display at Right-Center. I still don't like it, it is intrusive and does not work in an intuitive manor, but at least I am not pulling my hair out over it. This is _not_ a paper cut, this is more akin to someone pulling your finger nails out. Also why does the notification not close when I click it! Who's bright idea was it to make it(on mouseover) see through and click through?! What kind of usability study could possibly have thought this is a good idea? Look it notifies you of its message right? - Good! Then you go to dismiss it and it does not close! How frustrating. But its actually worse because it does not even let you click the damn thing! No instead you click whatever is behind it! Why would I _ever_ want this behavior? > - added support for integer gconf-key "/apps/notify-osd/gravity"
> Look it notifies you of its message right? - Good! > Then you go to dismiss it and it does not close! How frustrating. the rest of your UI that is underneath them, again without interrupting you. Actually I kinda like the fact that the notification is just a notification and you can click trough it. Maybe a close button could be a good idea though. > and you can click trough it. > Maybe a close button could be a good idea though. close the notification prior to being able to interact with your interface. but the default should be as it is (in JAUNTY not at all as in KARMIC) ... and if we have alternatives for those that like tinkering then that would be great. >interact with is located below the close button? quite hard to see what you're clicking on through the notification bubble. > > and you can click trough it. > > Maybe a close button could be a good idea though. > close the notification prior to being able to interact with your interface. > to interact with is located below the close button? Maybe the notification could unblur when shift or control is hold? Like this, by default the notification would be completely click-proof but when the user wants it, you can click on it and so close it. >Because you aren't supposed to dismiss it. >The notifications are supposed to be sufficiently out of the way that they do not interrupt your workflow. >You just leave them there. I should have the choice to dismiss them. Also part of the problem is they are displayed too long on screen. (Timer setting)? >If you /need/ to access something behind them, e.g. >the rest of your UI that is underneath them, again without interrupting you. If I want to " interact with the rest of your UI that is underneath them" thats a pretty big hint that I want the notification to go away, not turn transparent. Honestly who can possibly work with a load of notify bubbles hanging around. I need them to deliver the message and get out of the way. Also this click through madness, I have never seen this implemented anywhere else and it is not expected behavior. SilverWave: Remove Notify-OSD. You will get the EXACT behavior that you want. I don't understand why you are sticking with Notify-OSD when there is clearly a system for you that has been in use for some time. This report is quickly turning into a catchall bug for "everything anyone wants to complain about relating to notify-osd." With more than 20 duplicates, there are a lot of people subscribed to this bug who get emails every time someone posts something. For their sake, please try to keep comments here related to the issue at hand (the position of notifications in Karmic). Really, even that topic has been hashed out pretty thoroughly by now, so comments at this point should be minimal. For people wishing to discuss the color of notifications, the time-out of notifications, the ability to close notifications, and the click-through behavior of notifications, please take Mirco Müller's advice and move those conversations to the Ayatana mailing list. Even you have a good idea directly related to the position of notifications, that idea will make more of an impact if discussed on the mailing list than it will if you post it here in a comment. i am not buying that this was a design decision; no one with a sense of design or the capacity to see things through eyes would sign off on this. please just cop to the fact that there's some bug preventing the notifications from being drawn in the right place. If this wants to remove packages (excluding those starting with lib), abort the process and run "sudo aptitude unmarkauto <packages>" for them. Then retry it. The default positioning in 9.10 screams "broken" to me. I was almost certain some app was wrong about my screen resolution and was mis-placing the bubbles. I never would have dreamed it was a design decision. That said, "less customization" *is* definitely the way to go for the masses. Less is more these days. Look at the wild popularity of netbooks, Apple products, etc. -- extremely minimalistic and all the more functional for the most common usage patterns. And usage patterns are narrow and narrowing (web). People just want things to work out of the box. We (the masses) want stateless, androgynous black boxes with as much style, soul, and instant usability as possible. We don't want to know how it works, and we don't care to change it. But only if the default behaviors are spot-on in the first place. I should be suprised by these things, but i'm not anymore. They seem to think that we report bugs like this from a sort of theoretical point of view. Not just because it annoys us. - pop up a message the first time somebody has a notification, explaining why it's so ugly. Perhaps it will annoy it us less, if we knew what the flawed reasoning was. Problem still exists in Lucid. For most widescreens (16:10 and 16:9), which are becoming more and more popular, this does still cover the firefox searchbar which was apparently the reason for lowering the notifications. Aesthetically speaking the fixed slot-allocation schema is, shall we say, less than perfect, as I'm sure has already been stated ad infinitum. How about moving asynchronous notifications (i.e. new mail and instant message notifications) to the bottom-right corner whilst maintaining synchronous notifications (i.e. volume and brightness adjustments) in the top-right corner. That way asynchronous notifications will not interfere with window controls or other application elements which is still an issue for some (myself included) under the current system. I really do think that moving the asynchronous notifications (which triggered by applications and require no user input) to the bottom-right corner is the best solution here. It would remove that unsightly gap whilst bringing the notification system in-line with those of other operating systems (e.g. Windows). It's worth remembering that a significant number of Ubuntu users are converts from other operating systems or dual-boot into them, and speaking one such convert I can tell you now that the bottom-right is the first place I look for asynchronous notifications (even after three months of solid Ubuntu). I have no idea why this is listed as a "wish list" item. I would list it as critical for being able to use the computer for more than giggles and gossip. This may be great for twits (users of twitter) and folks just looking for entertainment. As for being able to anything else on here it is just about impossible if I make the mistake of starting rhythmbox. Every time the tune changes I get this huge bubble on top of browser tabs, controls for boinc, text I am trying to read. Just great as long as I do not play music. Thanks a bunch for this improvement. 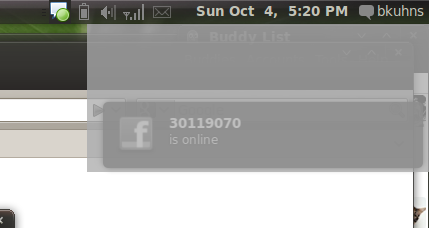 Mouse over the rhythmbox applet in the notification area and no nice, properly placed bubble comes up to give time and tittle. But I do have this honkingly big thing that is of no use to cover my work and interupt what I am doing. This is not a wish list item. 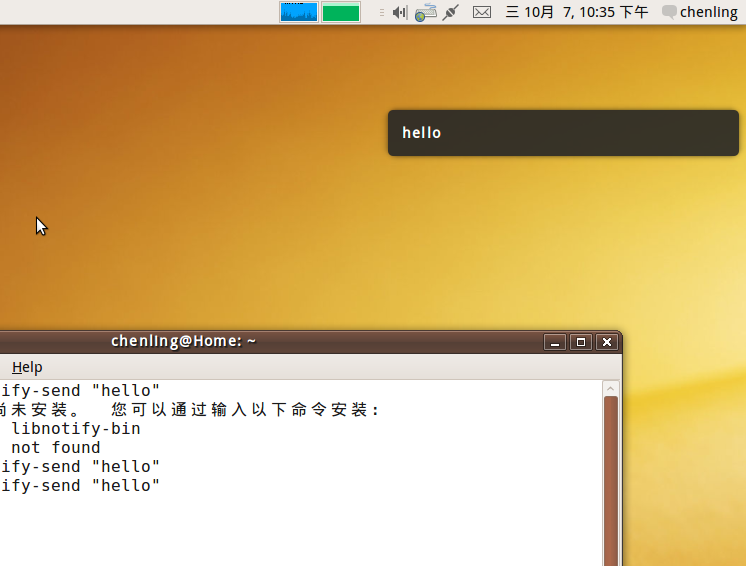 This is an invitation to use a different desktop environment. I actually would agree with the above comment. I thought some of the reasoning behind this was that it was covering up Firefox stuff. With this new placement, though, it's covering up more space than it was before. I even have a custom-css'ed UI that minimizes the space used by the top and this position still manages to cover up the important stuff. 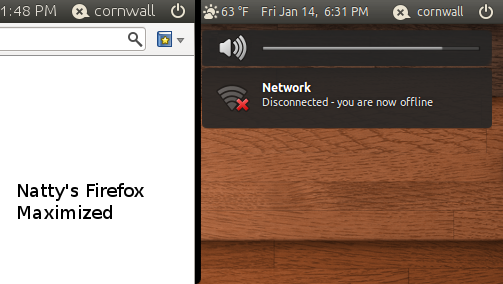 It's doubly nasty when I use a netbook (in which it STILL covers up important Firefox stuff!). I really like a lot of the changes that Ayatana have been doing. Cleaning things up left and right (I even support the putting the buttons on the left). This move, however, was a terrible one. I don't know if it is at all possible to change Mr. Shuttleworth's mind on this, since this report and an entire mailing list discussion has failed to catch his interest in the matter enough to even hint at putting it back. It will be available in the same PPA (https://launchpad.net/~gilir/+archive/updates/+packages) in a couple of hours. Why are we avoiding covering search bars when we're now covering *content*? This actually blocks out what people are *reading* or interacting with and is still called a usability enhancement? At least in the corner, it covers as little of what people might be reading or interacting with as possible. 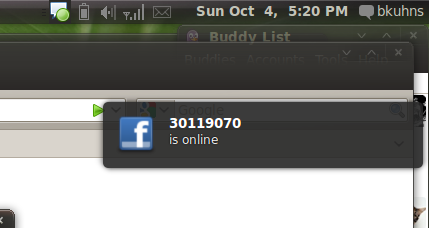 The two tier notification system looks particularly bad on smaller netbook screens. Please consider a less intrusive option for smaller screens such as putting all notifications at the top. I must say I don't understand your rationale. The choice of notification space blocks content with which I am working. This is definitely decreasing the quality of my user experience - thanks notification overlords. > space blocks content with which I am working. > use a slot immediately above that notification bubble slot. > mailing list. It is an open list anyone can join and participate. > useful information regarding the particular bug. AFAICT, only gravity 1 (NE) and 2 (E) actually do anything. All other gravity values just squash the notifications to the NE (upper right). The central misunderstanding behind the decision to fix the osd bubble and not provide configurability is that you know how a user is using their desktop. E.g. since users have the choice of mail client, you can't know whether the osd obscures important real-estate during message composition. In my case, that's exactly what happens. So when osd is displayed, I'm effectively interrupted and prevented from continuing to write the email I was working on. That's a horrible productivity killer. I fully support making opinionated decisions to give a good user experience in the default case. There must be some accommodations for customization though, or you'll really need to prevent the use of alternative editors, mail clients, web browsers, or even positioning of IM clients, etc. Either you have to lock down the entire desktop, or you have to provide people with a way to customize intrusive notifications. The alternative is to seriously negatively impact productivity for some slice of users. BTW, there is a model of an application that I think does notification-like positioning really well. Mail Act-On is a third party add on for Mail.app on OS X. Its results window is positionable through a preference pane option. When you click on the "Show results window" button in the preference pane, you can then just drag the results window to wherever you want to put it. Then you click on the button (which now reads "Hide results window"), the notification window's position is remembered so that it always comes up in the user positioned location. Very simple, clear, and with exactly the right amount of configurability that you want. Barry, I completely agree with your points, but I feel as though I should direct you to the Ayatana mailing list to discuss this issue. It's been mentioned above that a discussion over this "design decision" should be brought up on the mailing list. You seem to be quite active in it Ayatana list, so I'm not sure why you're wasting your very good points on this bug report that the benevolent dictator doesn't follow. This issue couldn't be address and *fixed* soon enough, but I don't believe this is the correct outlet. in Lucid with elementary installed everything was fine. the notification shows just under the panel and if volume is changed the notification goes under the volume notification. i don't like the bubbles with that space to the panel, it verytime looks like a bug to me. is it so complicated to change that behaviour? perhaps it IS possible with gconf-editor parameters? Jan: I believe the origin of the gap was to ensure that any window manager icons were still easily visible. Now that the default theme has the bubble semi-transparent and the default window-manager icons moved to the left-hand side this is probably less of an issue. It is of course intention, but you do raise a point that other make not think it to be so! Where can we download that configuration app? With unity coming up there will be quite a lot of space saved with the nifty global menu and the housing of the window buttons on the top panel. Essentially, the titlebar disappearing on maximize causes the search bar in firefox (and many other apps, actually) to be right smack under the top panel, only taking up a few centimeters under it. I think this shift can be taken advantage of in terms of notify-osd as well. See, the brightness/volume notification bubbles are pretty big (to fill up the space for the current model, I'm guessing). These notifications can get reduced in size to accommodate the fact that the important stuff is now flush with the panel. This way the other bubbles can get moved up a bit and free up a little room: Similarly, the system bubbles are even less intrusive (since the person is causing the adjustment these notifications require far less attention-grabbing). This also consistently differentiates system bubbles and the rest. Take a look at the attached for an example. I did not alter the sizes of the actual screenshots, just the notify-osd bubble. The fonts are just used differently in Natty than in Maverick so it appears altered. I hope Mr. Muller is still monitoring this report for I would be curious to know his opinion on the matter. Please avoid random changing of bug statuses and explain why they are being changed. Yes, please resolve this until Precise. This thing have been with us for almost three years now! Marking as Opinion and removing assignment since this needs design.